Run Win_Restore.exe in Windows 7/8/7PE/8PE environment. For Restore of Windows XP then also XP environment can be used. 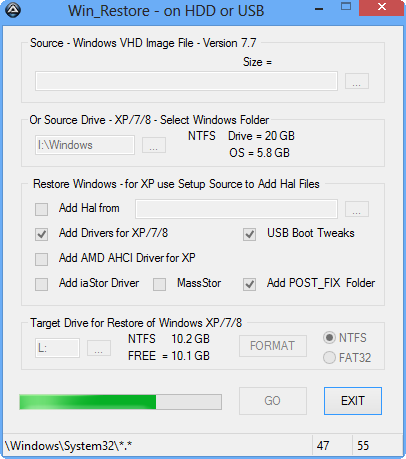 Run first VHD_W7C_drivers.exe plugin to add useful extra drivers and copy to Win_Restore\makebt\drivers folder. For XP you can Install 130 extra MassStorage drivers to make Universal XP that can boot from USB on all hardware. 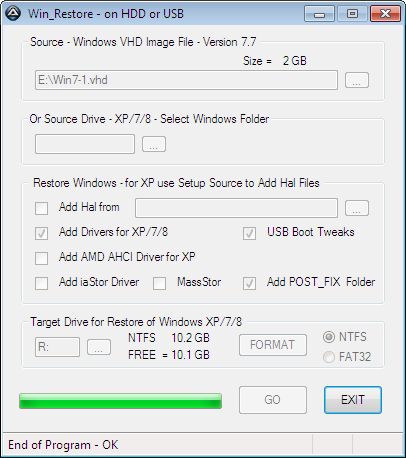 Install USB 3.0 Drivers for XP from folder Windows\DriverPacks\C\U as integrated by DPs_BASE.exe by using KTD option. require still improvement of the registry, but all other USB 3.0 drivers are expected to work. so that I can improve the registry in my program packages by adding the missing Parameters and WDF Service registry. Added USB_W7_Fix.exe so that you can fix Win 7/8 Drive or VHD for booting from USB. and can Make Boot Manager Menu on Selected Target Boot Drive . Do i get it right... i can make with this tool a universal clone (VHD) of my windows 8 or 7 system on an USB or other HD? So i can take the VHD with me and start it on an other PC and the system is like on my own PC? Correct? I'm confused with all the tools. Sorry for the question. And thanks in advance to whoever answers my question! Wimb Dear, thank you very much for this useful tool, it has served me well in all versions, with windows XP (in Spanish) but not with windows 7 SP1 (in Spanish). When I try to restore Windows 7 SP1 I always restores first the Program Files folder of host (in Spanish) which should not do and then the mounted disk with the operating system windows 7 SP1 (in Spanish) that I want to restore, copying me of this, the program Files folder in English. I tried to delete one of the 2 folders called, Program Files (in Spanish) and Program Files (in English) with the purpose of saving space, but either way the operating system fails me. Could you help me with the problem? Edited by joseim, 04 January 2014 - 05:42 PM. UEFI_MULTI.exe is the program to make other HDD or USB bootable with your VHD. It will copy the VHD and make Boot Manager and Grub4dos Menu to boot your VHD. Win_Restore.exe is the program to make other HDD or USB Drive bootable with the content of your VHD. It will copy the content of your VHD to a Drive and make the Drive bootable. May be you can try to Exclude the Unwanted folder by putting it in the Exclude list. You can edit file Exclude_Rest.txt in makebt folder as to Exclude unwanted files and folders. Can you give some Screenshot to illustrate the problem ? cheers wimb. thanks for clearing this out. Where "C" is the operating system, "M" is the USB drive, and "W" is the source VHD. The process "xcopy" do not let it fill in question of time. Thank you very much to correspond. Edited by joseim, 10 January 2014 - 05:45 PM. If it does not work you may consider to use VHD_W7_Create.exe to make New VHD derived from Win7 Source. So in this case instead of restore to destination Drive you make New VHD on destination drive and boot this VHD. The Win_Restore I worked with Windows 7 without SP, but with SP1 do not work 100% for the inconvenience foregoing. Still I have managed to restore the VHD on the HDD using USB_W7_Fix and other tools such as: MiniTool patition Magic and EasyBCD, however I wanted to see, is if you had a solution to the problem with Win_Restore and Win7SP1. Anyway thank you very much for answering. Edited by joseim, 12 January 2014 - 11:06 PM. it seems to me that the 2 descriptions you gave (for the usage of UEFI_Multi and Win_Restore) are a bit different in the wording but the meaning/target seems to be the same. Could you please expand & elaborate more where the 2 tools are different or/and if they have different targets ? The Target can be the same, but what is done at the Target is different. VHD is a container that can be copied to any drive. Signature and all files + registry are inside VHD and on copy of VHD there is no change in signature. UEFI_MULTI.exe needs only to make boot files to boot the VHD. Win_Restore.exe will mount the VHD and then copy the files + registry from inside VHD to Target Drive. Then the signature of the Target Drive must be taken into account to make drive bootable with Windows. After using Win_Restore there is no VHD on Target Drive, but just the files and folders of Installed Windows. 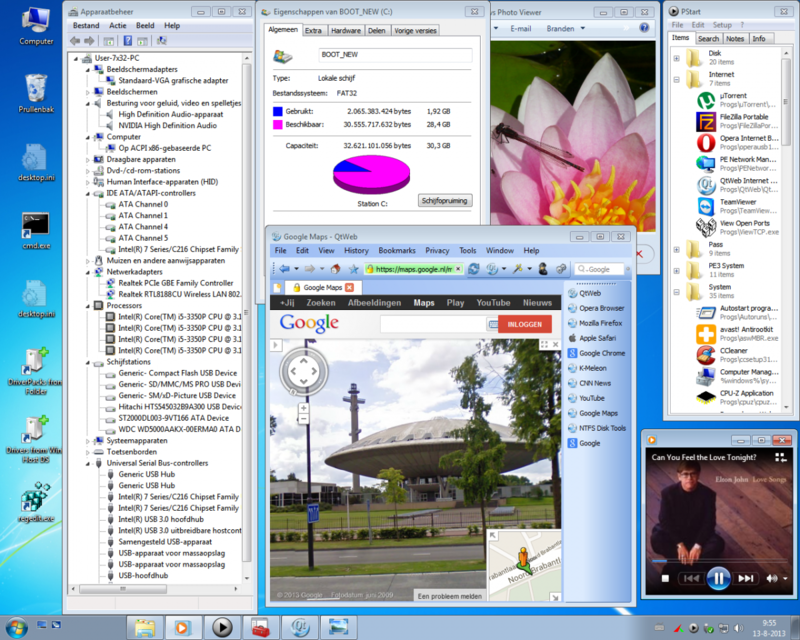 It is comparable and like using Ghost to Restore Windows and can be used instead of reinstall of Windows.